Whole grains are often great for health, yet most Americans consume too many refined grains and miss out on the benefits of whole grains… while adding excess empty calories to their eating patterns. To help your audience learn about whole grains, their health benefits, and how to incorporate them into a healthful eating pattern, I’ve put together a few engaging activities just for you! (And, if you’re really patient, you’ll find a PDF handout hidden in the post as well). Gather a few packages of foods that have varying whole grain content. Divide participants into groups and give each group a collection of those packages. 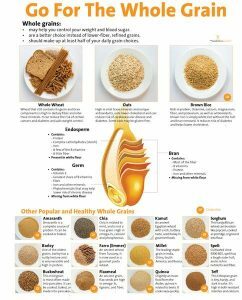 Have the groups line up their foods in terms of most to least whole grains per serving. Once everyone has finished making their selections, review their work as a class. Highlight the importance of using the Nutrition Facts label to evaluate whole grain content and draw everyone’s attention to which words to look for in ingredient lists. Make a note of front-of-package claims as well. Was anyone fooled by statements that hint being wholesome but are not whole grain, like, “100% Stone Ground,” “Multigrain,” “Honey Wheat,” etc? Explain the importance of 100% whole grains. Note that stone ground can be whole grain but you should check the ingredient list to be sure. If time permits, have the groups combine to line up all the product packages from most to least whole grains. How did everyone apply the knowledge from your discussion? This is a brainstorming activity, so all you’ll need is a space to write down people’s ideas (a whiteboard or giant notepad works especially well) along with a writing utensil. 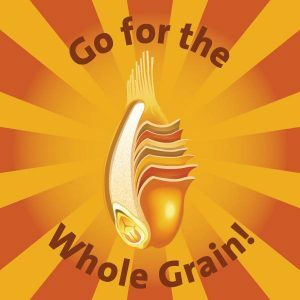 Much of the information that could help your clients internalize this lesson can also be found in the Go for the Whole Grain poster, though it is not required. 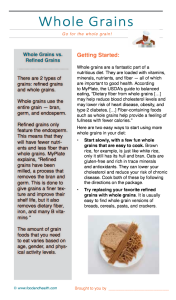 Discuss the health benefits of whole grains. 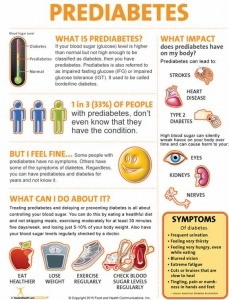 How do they impact blood sugar? Heart health? General nutrient intake? Once your group seems to have a solid grasp of the importance of whole grains to a balanced eating pattern, move on to common grain foods. Which contain whole grains? Which contain refined grains? Finally, to get to the crux of the matter, list common refined grain foods on your writing surface. What substitutions can people make in order to consume fewer refined grains and more whole grains? Discuss the ideas as a class, writing out compelling switches as you encounter them. 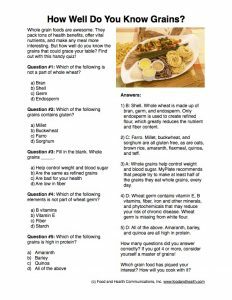 Distribute copies of the handout How Well Do You Know Whole Grains? Have participants take the quiz individually (this makes a great icebreaker or take-home assignment too), and then bring everyone together to go over the answers, addressing any questions they might have about the information provided. If you’d like, you can distribute prizes like these whole grain stickers to people who got the most correct answers. A new study out of Boston suggests that focusing on 10 specific foods in your diet may cut the risk of premature death from diabetes, stroke, and cardiovascular disease by almost half. For example, consuming too much sodium was linked with 66,508 deaths. Poor nut and seed intake was associated with 59,374 deaths. Processed read meat intake was associated with 57,766 deaths, while 54,626 deaths were linked with inadequate fatty fish intake. Minimal vegetable and fruit intake was linked to 53,410 and 52,547 deaths, respectively. Sugar-sweetened drinks were tied to 51,695 deaths. Demographics also made a difference. For example, men and women fared differently in the study. Women were less likely than men to die from poor diets and younger people were at higher risk than older individuals. Hispanics and blacks had higher risk than whites, and individuals with less education were at higher risk than more educated people. Deaths from cardiovascular disease decreased by 25% between the two survey periods because of improvements in dietary habits such as eating more polyunsaturated fats, nuts, seeds, whole grains, fruits, and fewer sugar-sweetened drinks. 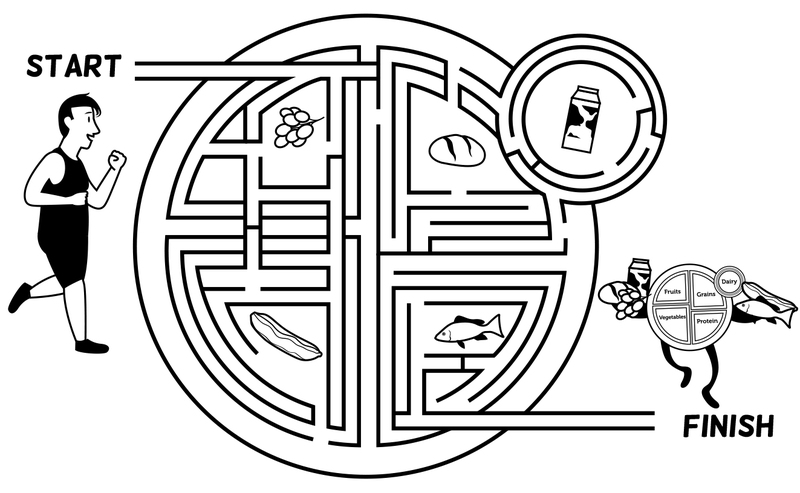 Consumers can reduce their risk for chronic disease by adopting one dietary habit at a time (such as eating fatty fish twice per week or choosing water over sweetened beverages) and then moving on to another positive habit once they’ve mastered the first. This helps build confidence and motivate people to continue building healthful eating patterns to reduce their risk of chronic disease. Mueller, Noel T., PhD, MPH, Appel, Lawrence J. Attributing Death to Diet Precision Counts. JAMA. 2017;317(9):908-909. Look at any popular magazine these days and you’ll find at least one diet that bashes grains. Whether it’s Paleo, the Military diet, or the “whole 30”, someone, somewhere is out there trying to get you to eat a bun-less sandwich. But what they may not realize is that anti-carb diets are a thing of the past. Grains are back, and for good reason. Most Americans miss the mark on fiber intake, consuming a mere 15 grams per day. The subjects in the Tufts study that ate whole grains ate about 39 grams of fiber daily versus 21 grams in the refined carbohydrate group. 1 Researchers believe the feeling of fullness in whole grain consumers affects the brain’s ability to regulate metabolism. Because your brain does not perceive that you are conserving energy, metabolism is not reduced. This is good news for carb lovers. Making the switch to whole grains can be easy. 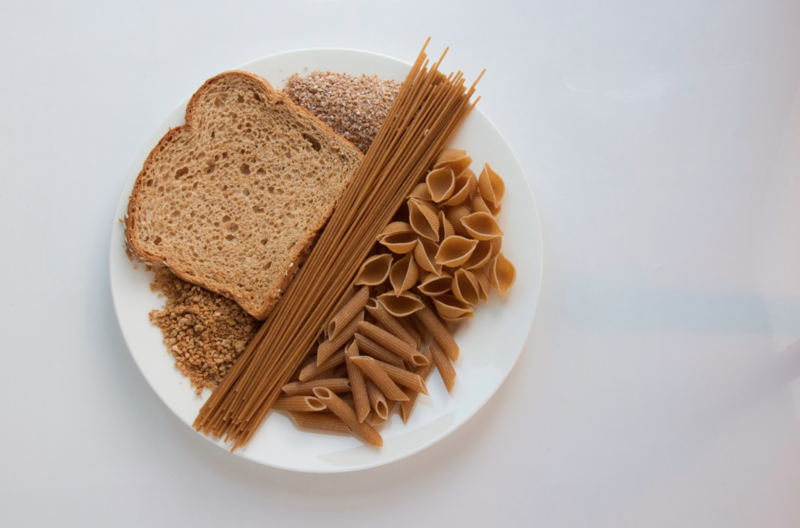 Swap brown rice or quinoa for white rice, or whole wheat pasta and bread for white bread or pasta. Try bran or wheat-based cereals in place of corn or rice. Whole grains are the new black. Karl, J Philip, Meydani, Mohsen, Barnett, Junaidah, et. al., Substituting whole grains for refined grains in a 6-wk randomized trial favorably affects energy-balance metrics in healthy men and postmenopausal women. American J of Clinical Nutrition, February 8, 2017, doi: 10.3945/?ajcn.116.139683. Mozaffarian, D, MD, Dr PH, Hao, Tao MPH, Rimm, Eric B, Willett, Walter MD, Dr PH, Hu, Frank MD, PhD. Changes in Diet and Lifestyle and long term weight gain in men and women. N Engl J Med 2011; 364:2392-2404. June 23, 2011. Burfoot, Amby. Despite the anti-carb diet fads, whole grains are still good for you. The Washington Post: 20 March 2017. 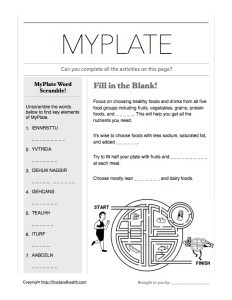 Here’s a brand-new My Plate activity page! This page is a perfect way to communicate the key lessons of MyPlate while keeping things light and fun. 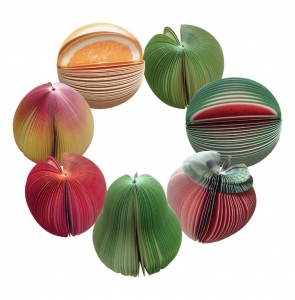 It makes an excellent icebreaker or game, and you can also use it as a prize at your next wellness fair booth! Focus on choosing healthy foods and drinks from all five food groups including fruits, vegetables, grains, protein foods, and _ _ _ _ _. 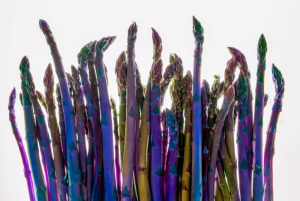 This will help you get all the nutrients you need. It’s wise to choose foods with less sodium, saturated fat, and added _ _ _ _ _ _. Try to fill half your plate with fruits and _ _ _ _ _ _ _ _ _ _ at each meal. Choose mostly lean _ _ _ _ _ _ _ and dairy foods. Unscramble the words below to find key elements of MyPlate. Focus on choosing healthy foods and drinks from all five food groups including fruits, vegetables, grains, protein foods, and DAIRY. This will help you get all the nutrients you need. It’s wise to choose foods with less sodium, saturated fat, and added SUGARS. Try to fill half your plate with fruits and VEGETABLES at each meal. Choose mostly lean PROTEIN and dairy foods. Here’s the free printable activity page handout! How will you use your copy? 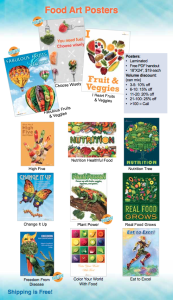 And here are some of my favorite MyPlate resources, available now in the Nutrition Education Store! The goal has always been to make your jobs easier. We kept that goal in mind as we researched and designed new materials. We thought about it as we chased down peer-reviewed studies, or stayed up far too late making slight art adjustments. 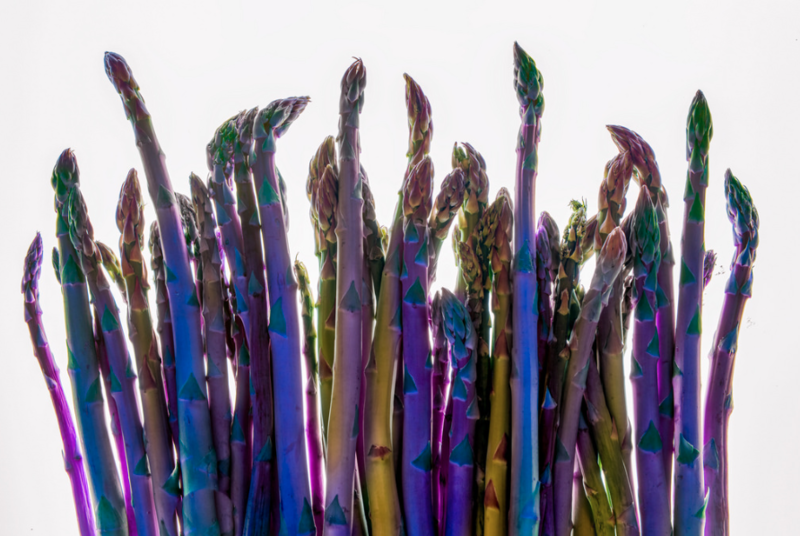 We thought about it as we edited handout drafts, and as we photographed our latest hauls from the farmers’ markets. We never stop thinking about it, and the result is our best catalog yet. Today I’m proud to offer you our newest materials, our top-selling classic resources, and tons of other fun educational tools that you didn’t even know you needed. 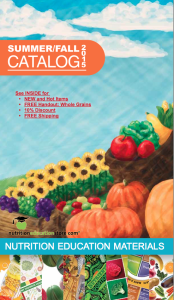 They’re all in the Nutrition Education Resource Catalog, and they’re all available to you, right now. More posters than you’ve ever seen before! Handouts that break down any topic into understandable terms! 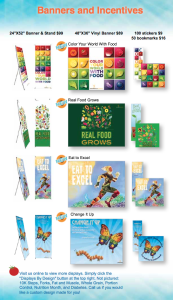 Engaging and memorable bulletin board and display kits! PowerPoint presentations with leader guides, speaker’s notes, and handouts! 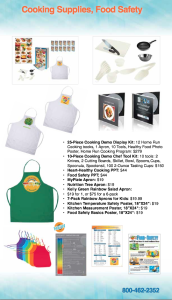 Everything you need for the best cooking demonstrations ever! There’s actually a lot more, but I didn’t want the list to just go on forever! Take a look at the catalog and see it all for yourself! I really think you’ll enjoy it. Plus, if there’s anything you want that you don’t see, just let me know and my team and I will make it for you. Oh! I almost forgot the best part! The catalog comes with a brand-new, totally-free handout. It covered the basics of grain foods: whole grains vs. refined grains, how to cook with grains, the health benefits of grain foods, and even ways to replace refined grains with whole grains. Drop by this link to get your very own copy! 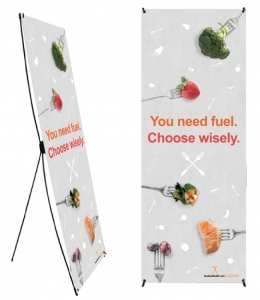 And, since we’re here to help you look your very best right now, here are some fun new materials from the Nutrition Education Store!